Izzy Montague was one of several parents who recently challenged her child’s primary school over forcing children as young as five to take part in an event celebrating gay pride. Since making a complaint about the school’s handling of the event, Izzy says she has been victimised by the school. Her story was widely covered in the news ahead of her meeting with school governors concerning her treatment. The Christian Legal Centre is helping her – along with several other families – to challenge the school’s promotion of LGBT ideologies. Heavers Farm Primary School held an event on 29 June 2018 called ‘Proud to be Me!’ to coincide with Gay Pride Month. It was originally intended to be a march and parents were invited to attend. When several parents, including Izzy, challenged the march, intending to protest, the school cancelled the march and held it as a smaller event. However, parents were still not allowed to withdraw their children, being toldthat no opt-outs were allowed as the event related to the spiritual, moral, cultural, mental and physical development of pupils and not PSHE. 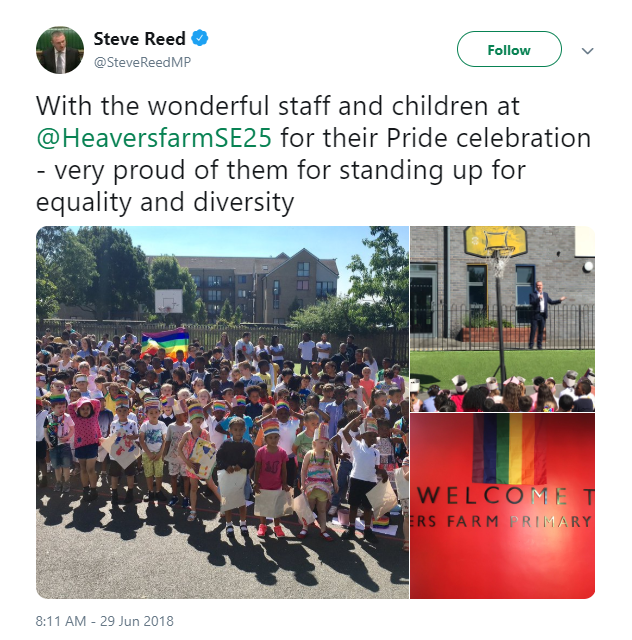 Steve Reed, Labour MP for Croydon North attended the celebration, tweeting photos of the event with the caption: “With the wonderful staff and children at @HeaversfarmSE25 for their Pride celebration. The pictures show gay pride flags decorating the school, being held or being worn by young children. On 13 July, Izzy wrote to the school about the parade – criticising their actions in failing to provide opt outs and for holding the event in the first place. Three days later, she received a holding letter, saying the school would investigate. Having heard nothing further, Izzy wrote again on 3 September, about the event and the lack of communication from the school. She finally received a response at a governors meeting on 12 September, where ‘Proud to be Me!’ was rebranded to be purely about tolerance, rather than having anything to do with Gay Pride. A week later, Izzy met with the school’s executive headteacher, Susan Papas to discuss the complaint. The headteacher’s daughter, who also works at the school, attended the meeting wearing a t-shirt with the message: “WHY BE RACIST, SEXIST, HOMOPHOBIC, OR TRANSPHOBIC WHEN YOU COULD JUST BE QUIET?”. Izzy understood the t-shirt to imply that she was homophobic and that the school was not interested in anything she had to say. The pride event was not the only example of the school promoting LGBT ideology on young children. The school’s website proudly displays the results of a lesson themed around Martin Luther King’s “I have a dream” speech. In a picture, a year 1 pupil beams while holding up the message “I have a dreem if bois cood go to the saim toilet as gerls”, suggesting that the lesson conflated gay and/or transgender rights with the American civil rights movement. Izzy also raised concerns about Stonewall posters displayed around the school. Following the meeting, further communication took place between Izzy and the school. Then, her five year old son was given two detentions totalling four hours, and when Izzy came to discuss her son’s treatment was barred from the building. Again, Izzy wrote to the school, raising safeguarding concerns about the incident which Izzy says were not taken seriously. 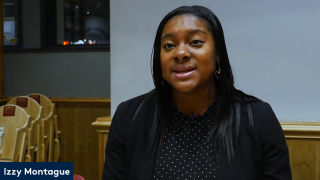 “After I complained about my young child being forced to take place in an event that goes against our Christian beliefs, the school’s attitude towards me changed completely. I know other parents who are afraid to speak up because of how the school has treated me. “It was like being bullied. They stopped treating me like any other parent but were antagonistic towards me. I believe that they retaliated against me by unreasonably excluding me from the premises, victimising my child and not taking my safeguarding concerns seriously. Izzy, along with her husband Shane have since removed their child from the school. Her complaint to the school’s governors led to a meeting on Tuesday 20 November. Although seven other families asked to attend, they were denied the opportunity on procedural grounds. “In another example of ‘totalitolerance’, those who preach tolerance and diversity the loudest do not appear to be interested in practising it. “The treatment of parents at Heavers Farm Primary School represents one of the most chilling breaches of parental rights I have ever seen in my many years of working on educational issues.